Cheryl August is Our Mensch of the Month! Mazel Tov to our August Mensch of the Month, Cheryl August! If you do not know her (which seems impossible) please meet Cheryl in her own words! I was born outside of Rochester, NY. I worked over the years as an administrative assistant in the legal and real estate fields. I met Barry when he was transferred to the Rochester area by the Veterans Administration. Because of his job we have lived in San Diego, the San Francisco Bay Area, Boston area, and Vermont before retiring to North Carolina to be near family. I was not born Jewish but after meeting Barry and going to services with him, I realized that I had found the spiritual home I was looking for. After a year of meeting weekly with a Rabbi, I had my mikvah a month before our wedding. After moving here we did not find a congregation that we felt comfortable with. We then heard about Congregation B’nai Israel shortly before the High Holidays. We attended a Friday service and everyone was so friendly and welcoming that we knew we had found a home. Plus, we both really liked Rabbi Liebowitz. For me I feel that the congregation is like a cherished friend to me. I am so grateful to the support everyone gave to me after Barry passed away, especially Rabbi Liebowitz. I really appreciate that so many call to check on me whenever I have been absent from services or if I am sick. A funny story – Several years back I visited Ireland for two weeks. I had forgotten to remind anyone that I was going to be gone. The day after my return my doorbell rang and there was the sheriff checking on me. It seems that the Rabbi as well as many other members were concerned they had not seen me in a while and had called the sheriff. It gave me a warm feeling to know others cared. I got involved in the Temple several months after Barry passed away when they put a notice in Temple Topics for a volunteer for financial secretary. I felt I needed something to keep me busy and volunteered. I also became more involved at that time in Sisterhood which was a great experience learning so much about the history of Sisterhood and the Temple from all the older members. I eventually became the Treasurer and am currently the President of Sisterhood. I am so grateful to all the women in Sisterhood and the wonderful work we do on the bake sale to support the Temple. I am grateful to have found this congregation and the sense of community that is here. I wish to be able to do whatever I can to keep the Temple as not only a place of worship, but as a community of caring individuals. Hank Steinberg is Our Mensch of the Months for June! If you are a member of Temple B’nai Israel or the Greater Spartanburg Community, you know the friendly face and warm handshake of Hank Steinberg. While Hank deserves to be Mensch of the Decade, we honor his strong presence in our congregational family for the month of June! 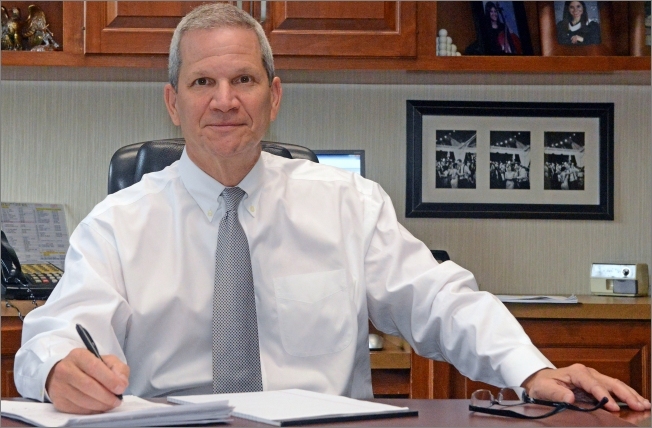 “I was born and educated in Spartanburg and attended local schools including Spartan High. I married Marla Pincus from Dallas TX and we have 3 children. Our married daughters have the same last name: Daughter Samantha is an attorney in Miami married to Eric Funt. They have our first granddaughter Eden (age 2) and another granddaughter is due in late August. Daughter Shelli is a dentist in Atlanta married to Josh Funt (Eric’s brother). Our son Brian works for a national insurance firm in Atlanta. Growing up here meant being active in the Temple. My mother (Kathy) helped direct a number of Temple plays, always worked at the bake sale, and we swam at the Glen Hills Pool behind the Shrine club while the ladies played mahjong and the men played cards. It was a tight knit community. My mom and my sister Linda passed away from breast cancer at ages 61 and 40. We had an active BBYO group when I was a teenager and we participated in the Dixie Council BBYO meetings. It was a great group of people including Cathy Lewson and David Blumenfeld. After working several years, I moved back to Spartanburg in 1986. My father told me the first check I would write every year would be to the Temple. He was in charge of the Aliyah sales so I quickly learned my parents were very involved in Temple life, and financial support for the Temple was an integral part of our lives. The call came to serve on the board, and I agreed, for over 20 years serving twice as President of the Temple; 2 years in my 30s and 2 more years in my 40s. I vividly remember taking my oldest daughter Samantha to services every Friday night where she would fall asleep in my arms on the bima. (The Presidents used to sit there during services.) Marla became a Sunday school teacher for a number of years while our kids were growing up. Why drop them off when you can participate? Back in the 90s we helped form a Temple softball team and basketball team and we had a lot of fun getting together to represent the Temple. Jon Lewson, Bob Britanisky, Brian Goldman, Andrew Green, Rex Russel, and many others remember the fun times. We were sort of the Ivy League team; good SAT scores but slow. We had quarterly golf outings for about 10 years with as many as 24 members playing. My dad (Jack Steinberg) and I came up with the idea of a long term fund that would sustain the Temple in times of need so we started the Endowment Fund in 1995. We raised about $500,000 by members who are recognized on the Pillars of the Community plaque located near the Sisterhood room. The people on the plaque should be proud to have been a part of that forward thinking. Many other organizations have such funds which improve their quality of life and sustain the organization through tough economic times, or a downturn in membership. The purpose of the endowment fund was to initially help supplement the salary of the Rabbi when we switched to the Reform movement in order to attract better candidates. Later the board was allowed to redirect the funds for unforeseen expenses and to proactively take care of our buildings. Our current campus began in 1963, and the Sunday School building was added in the early 70s. We saw an influx of young families to our area starting in the mid-90s and by 1999 I was concerned that our facilities were dated. So I hired an architect to come up with suggestions and then went to a number of families for support and to ask for a major financial commitment to fund the expansion and update of our facilities. The congregation raised over a million dollars and the project was paid in full as we added the sisterhood room, a new expanded and modern social hall, a Rabbi’s office, updated kitchen, new playground, covered walkways between the building and into the Sunday School, a permanent Sukkah, portico to the Temple, and sports Pavilion. There were so many members that helped with this process, and their names are on a plaque honoring them in the main Temple Lobby. Bob Lyon told me to stay off the building committee so I wisely listened to him, and we had 5 talented people run the project with our builder. April Mensch of the Month! Nancy Rosenberg has been a familiar face in synagogue activities since she was 3 months old. Her parents, Seymour and Linda Rosenberg relocated from Niagara Falls, N.Y. to Spartanburg, S.C. for work, an active life within Congregation B’nai Israel, and to raise their four children. For Nancy, childhood in the congregation meant growing up in “one big family.” Adults were called “aunt and uncle.” Her friends from the synagogue were also her friends at school and in social events. The Synagogue was the center of both religious and social life. Nancy remembers how well-attended services were and very large Onegs. One of the happiest and proudest moments in Nancy’s life was her Bat Mitzvah. She conducted Friday night service and chanted her Haftarah. As an adult, Nancy enjoys being involved. She serves on the care committee with Sandy Smiley. Her participation includes visiting people in their homes bringing candy and baked goods to brighten their day. Nancy has served in sisterhood activities throughout her adult life and is past president of our local chapter of Hadassah. Her lemon and almond pound cakes are famous sellers at the Sis- terhood Annual Bake Sale for which Nancy bakes 12. Judaism with its prayers, customs and traditions means continuity for Nancy. The continuity brings her a great deal of comfort in her spirituality as well as reaffirmation in life. L’Chaim for our March Mensch of the Month, Dot Frank! We honor Dot Frank as our first Mensch of the Month. Dot is a Greer, S.C. native who married Marvin Frank in 1950. She became active in Temple B’nai Israel in January of that year, and converted to Judaism a year later in the old synagogue on Dean Street. Dot was the first conversion officiated by Rabbi Wrubel, who later remarried Dot and Marvin in a traditional Jewish wedding on January 7th, 1951. An extremely energetic young woman, Dot graduated from Spartanburg General Hospital’s nursing program in 1950. She worked outpatient for four years then began a thirty-nine-year career with Orthopaedic Associates. Working did not keep Dot from being very active with her congregational family. She was a founding member of Temple B’nai Israel Sisterhood in 1950. Dot recalls that both women and men were active in the synagogue back then, but within their own separate groups. The congregation served not only as a place of worship but provided all social activities for the Franks. Families were very busy with dinners, game nights, entertainment and all Temple functions. Dot was active in fundraising, participating in the very first Sisterhood Bake Sale. 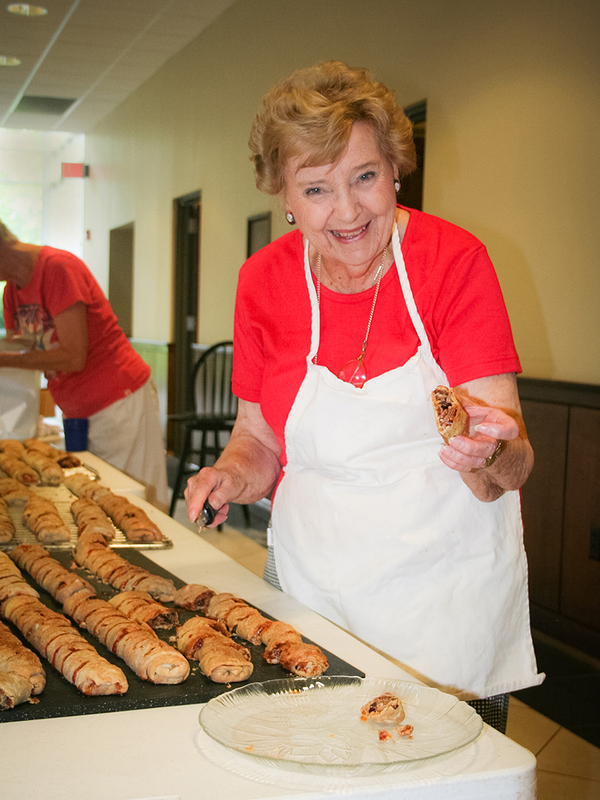 She has baked and worked at each Bake Sale for 67 years! The bake sales started with cheesecakes, and the Sisterhood maintained both a meat and dairy kosher kitchen. Dot reminisced about the ladies with whom she became like a sister, their “girls’ beach trips,” and the weekend family get-togethers.